To examine the effect of marital status and gender on stage at diagnosis, tumor grade, treatment type and cancer specific mortality (CSM) in patients with localized renal cell carcinoma (RCC). Within Surveillance, Epidemiology, and End Results registry (2001–2013), we identified 57,700 patients with T1–2 N0 M0 RCC. Logistic regression and competing-risks regression models tested the effect of marital status and gender on stage, tumor grade, treatment type and cancer specific mortality (CSM). Of all patients, 8.8, 10.6 and 14.8% were, respectively, widowed, separated/divorced and never married. The three categories accounted for 3.9, 9.0 and 14.9% of males (35,641) and for 16.7, 13.1 and 14.7% of females (22,059). Widowed (OR 1.13, p = 0.04), separated/divorced (OR 1.16, p = 0.02) and never married status (OR 1.38, p < 0.001) predisposed to higher rate of no surgical treatment. Widowed (HR 1.32, p < 0.001) and separated/divorced (HR 1.32, p < 0.001) status predisposed to higher CSM. 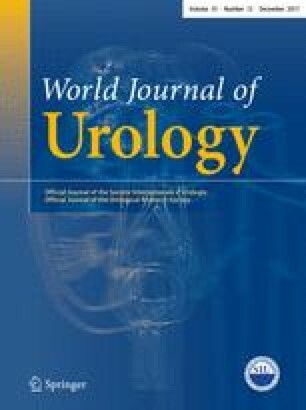 Male gender predisposed to higher T-stage (OR 1.12, p < 0.001), higher tumor grade (OR 1.35, p < 0.001), no surgical treatment (OR 1.23, p < 0.001) and higher CSM (1.13, p = 0.01). Interaction tests between gender and marital status failed to reach independent predictor status in all analyses. Male patients are at higher risk of less favorable baseline characteristics. Additionally, male, widowed and separated/divorced patients exhibit worse cancer control outcomes after treatment for T1–2 N0 M0 RCC. These observations indicate the need of more focused attention to those patients prior to, as well as after treatment for localized RCC. Michele Marchioni and Tristan Martel contributed equally. Protocol/project development: Marchioni, Martel, Bandini and Karakiewicz. Data collection or management: Marchioni, Bandini, Pompe, Tian. Data analysis: Marchioni and Tian. Manuscript writing/editing: all authors. Karakiewicz is acknowledged for supervision.